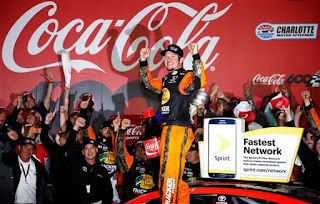 Martin Truex, Jr. and Furniture Row Racing won the Coca-Cola 600 at Charlotte Motor Speedway Sunday night, leading 392 of 400 laps – a whopping 588 of 600 miles -- in NASCAR’s most demanding event. Truex didn’t just dominate Sunday’s race, he administered an old-fashioned, woodshed whipping. On a weekend punctuated by unpredictable weather and constantly changing track conditions, Furniture Row was the weekend’s only constant. They were seventh in opening practice, climbing to third-fast in Round Two before winning the pole with a fast lap at 192.328 mph. They also topped Happy Hour, before placing the field solidly in their rear-view mirror at the drop of Sunday’s green flag, and keeping it there all night long. There have been other dominant days in NASCAR’s history. The late Jim Paschal set the previous NASCAR record for miles led in a single event; leading 502.5 miles in the Coke 600 nearly half a century ago. Jeff Burton led green-to-checkers – 300 consecutive laps -- at New Hampshire Motor Speedway in September of 2000, but those performances paled in comparison to Truex’s Sunday dominance. 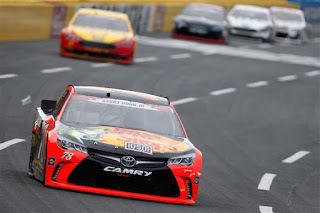 With apologies to Leonardo DiCaprio, Truex was King of the World at Charlotte Motor Speedway Sunday, ending his agonizing run of early season disappointment with one of the greatest performances in the history of the sport. In their inaugural season with Toyota, Truex and crew chief Cole Pearn have had more than their share of “close, but no cigar” moments. They led the season-opening Daytona 500 just 50 feet from the checkered flag, before falling to Denny Hamlin by a mere .011 seconds. That Daytona debut was precursor for the weeks to come, as Truex contended for victory time after time, only to fall short of Victory Lane. 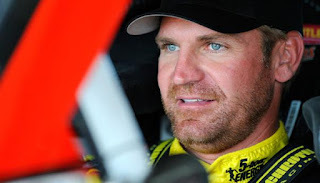 He led 141 laps at Texas Motor Speedway last month, only to finish sixth when a late-race caution flag left him alone on the race track while his closest pursuers pitted for fresh tires. He led 172 laps at Kansas before a broken screw lodged behind his right-front wheel on a decisive late pit stop, forcing an unscheduled return to pit road that turned certain victory into a demoralizing, 14th-place result. He contended again at Dover two weeks ago, leading 47 laps before being swept-up into a late-race restart crash caused by Jimmie Johnson’s balky transmission. The New Jersey native has experience in “getting through those moments.” His longtime girlfriend, Sherry Pollex, was declared cancer-free in January after waging a heroic battle with ovarian cancer; a battle that gave the couple a renewed set of priorities and a new appreciation for a team owner – Barney Visser -- who stresses the value of family, above all. "He really and truly treats (everyone) like family," Truex said. "It's a big deal to all these guys to get to share this with him tonight." "It's been frustrating," said Visser of the 2016 season. "But I've learned to live with the frustration. Racing will do that to you." Truex admitted wondering what might go wrong in the final laps Sunday, imagining what horrifying twist of fate might rob him and his team of their moment, yet again. "There was a few moments toward the end of the race where I was thinking, 'Please, I don't want a caution,’ he said. “When you see the white flag, you have a finger or two crossed on the steering wheel, trying to get to the end." Sunday’s performance validated Visser’s decision to align his team with Toyota in 2016. But it’s not like major changes were needed. Truex finished fourth in the 2016 Chase for the NASCAR Sprint Cup; in title contention all the way to the final event at Homestead Miami Speedway. But Visser -- a Vietnam paratrooper with the 173rd Airborne Brigade -- has always charted his own course, both in business and in racing. 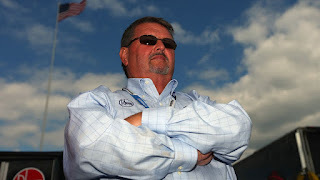 Unhappy with his place in Chevrolet’s Sprint Cup Series pecking order, the Colorado businessman announced plans to switch manufacturers at season’s end, abandoning successful partnerships with Chevrolet and Richard Childress Racing in favor of the uncharted waters of Toyota. FRR set realistic goals for the opening weeks of the campaign, with Visser cautioning it could be “late May or early June” before his team made full use of its new affiliations. Sunday night, he stood near the back of Charlotte’s raucous Victory Lane celebration, looking a bit bewildered amid the confetti, booming pyrotechnics and spraying champagne. His team had won twice before – a Southern 500 score with Regan Smith in 2001 and Truex’s win at Pocono Raceway a year ago – but Visser had never been there to celebrate in person. "It's finally time to be here," he said. "I've experienced (winning) at home, but this is great. I could do this every week." "This is the most excited I've ever seen him," laughed Truex. "I'm pretty sure he even hugged me." With a return to Pocono’s Tricky Triangle just a week away, there could be more celebrations to come. 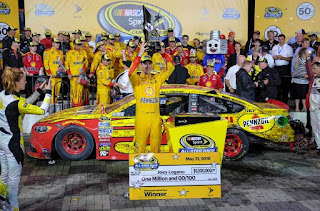 NASCAR earned an “A” for effort and a “D-minus” for implementation Saturday night, as the sanctioning body’s new Sprint All Star Race format hurtled off the rails, plummeting the event into an maelstrom of confusion and controversy that sadly overshadowed the on-track product. 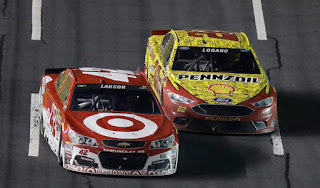 Joey Logano claimed the $1 million winner’s prize, outdueling sophomore phenom Kyle Larson in a late-race battle that saw Larson carom off the Turn One wall with less than two laps remaining. Unfortunately, the edge-of-your-seat finish did not make up for a series of procedural foul-ups that watered-down a planned, 13-lap finale and left drivers, teams, officials and fans alike confused over who led the race, who trailed and even who was on the lead lap. The new format – brainchild of former series champion Brad Keselowski – required drivers to make a green-flag pit stop in the opening, 50-lap segment. And by the midway point of the run, all but one competitor had done so. Joe Gibbs Racing driver Matt Kenseth remained on the track, however, trapping the balance of the field a lap down. Kenseth’s strategy unraveled when Jamie McMurray spun in Turn Two with less than four laps remaining, creating a caution period that prevented Kenseth from coming to pit road before the end of the segment. He was eventually penalized one lap by NASCAR, but race officials failed to allow the lap-down drivers to exercise the wave-around option to regain their lost lap. “I don't know how in the hell we were scored a lap down after they stopped the 20 car,” said Tony Stewart. 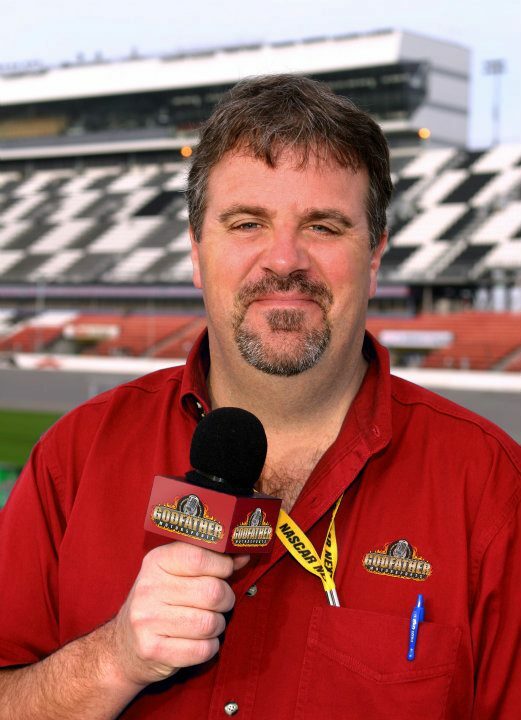 “It's the most screwed up All-Star Race I've ever been a part of. I'm glad it's my last one. I'm madder than hell because I don't understand how the hell they've officiated this, from start to finish." NASCAR eventually got the running order correct, and all the lapped drivers utilized subsequent wave-around opportunities to regain their lead-lap status. But a planned, 13-lap final segment – with the front half of the field on old tires and the back half on new rubber – fizzled when a multi-car Segment Two crash eliminated a number of potential contenders. In the end, only Jimmie Johnson and Kyle Busch began the final segment on old rubber; far outnumbered and quickly gobbled-up by those allowed to install four fresh Goodyear Eagles. Unfortunately, there were signs of trouble Saturday night, even before the green flag flew. Despite two weeks of explanation, the vast majority of NASCAR fans remained thoroughly confused by the new All Star format. In addition, the blind draw that preceded the final, 13-lap dash actually encouraged teams to give less than their best effort. At least one Top-5 driver plummeted mysteriously backward in the final few laps of Saturday’s second segment; clearly attempting to fall out of the Top-11 and earn an up-front starting spot for the finale. That’s not what fans pay to see. NASCAR’s Miller admitted that the sanctioning body was unprepared for Kenseth’s strategic twist Saturday, saying, “We ran into a situation where our race procedure didn't give us the opportunity for a wave-around and it created a lot of confusion. It's very unfortunate that this situation cropped up and a lot of people walked away from here disappointed. We're disappointed, as well." Speaking off the record, one All Star competitor said he believes NASCAR settled on its 2016 All Star format far too late to prepare for the event. Clearly, that late rollout left insufficient time for NASCAR to troubleshoot the process and anticipate the myriad ways that teams like Kenseth’s might attempt to manipulate the format to their own benefit. There’s no fixing it now, but NASCAR has plenty of time – 51 weeks – to get it right for next season, simplifying the process to emphasize racing, rather than rules. Eliminating the word “mandatory” from the All-Star format should be Step One. Mandating pit stops reduces the number of available options and locks teams into a single strategic scenario. Remove the competitive handcuffs and let teams get creative again. Step Two is to eliminate any rule, regulation or procedure that rewards going slowly. No more inverts, no more incentives for finishing in the back of the pack. “Hammer down” should be the only phrase that pays. There was plenty to like about Saturday night’s All Star Race. It – and the Sprint Showdown that preceded it – featured multiple passes for the lead and more side-by-side racing than we’ve seen in the last five All Star Races, combined. “I don't know how you can get much more compelling racing than what we saw today,” said Keselowski afterward. Junior had it right Saturday night, and NASCAR will do well to listen. When all else fails; simplify, simplify, simplify. Any All Star format that cannot be explained to the masses in 20 seconds or less is a lousy format. Sprint All Star Race 2017 needs to be more about racing and less about rules. 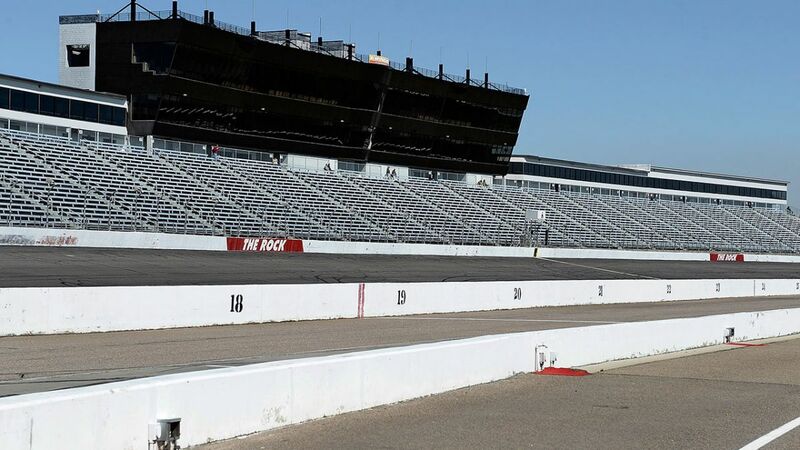 Rockingham Speedway has a new owner today, but he is not exactly a stranger to the property. Ownership of the historic North Carolina speed plant was assumed today by a Florida-based holding company owned by Bill Silas, who was a former stakeholder in the track along with partner Andy Hillenburg. Silas’ BK Rock Holdings entered a $3 million bid for the property at a public auction on May 5, and that bid was accepted this week when an additional period for “upset bids” passed with no further interest.Journal. North Carolina’s Farmers and Merchants Bank initiated foreclosure proceedings on the track in late 2014, with a judge eventually placing the property into receivership. Silas’ $3 million bid will be used to pay remaining creditors, leaving the track to move forward debt-free. Silas has not spoken directly of his plans for the facility, but told GodfatherMotorsports.com in mid-April that he does not believe the track can ever again succeed as a racing-only venue. “It can’t be just racing,” he said. “Two or three races a year will not begin to pay the bills. The track needs other (non-racing) events to draw people in. The place is totally underutilized. Silas also said he did not anticipate running the speedway himself. 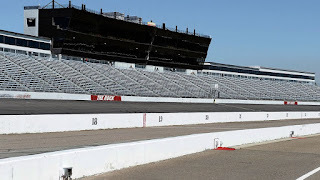 Rockingham hosted races on what is now the NASCAR Sprint Cup Series from 1965 to 2004. It has laid silent since a Camping World Truck Series event in 2013. Stewart-Haas Racing put NASCAR’s latest “rumor that will not die” to bed today, announcing that former Sprint Cup champion Kevin Harvick has signed a long-term contract extension to remain with the organization. Harvick’s status has been the subject of widespread speculation since SHR announced earlier this year that they will join the Ford camp in 2017, ending a longstanding technological partnership with Chevrolet and Hendrick Motorsports. Despite repeated denials, various media outlets have continued to report – as recently as yesterday – that Harvick would leave the team at season’s end to remain in the Chevrolet camp. The 2014 Sprint Cup Series champion reacted angrily to those reports, Tweeting yesterday that they originated from a “bunch of people who make $%& up. 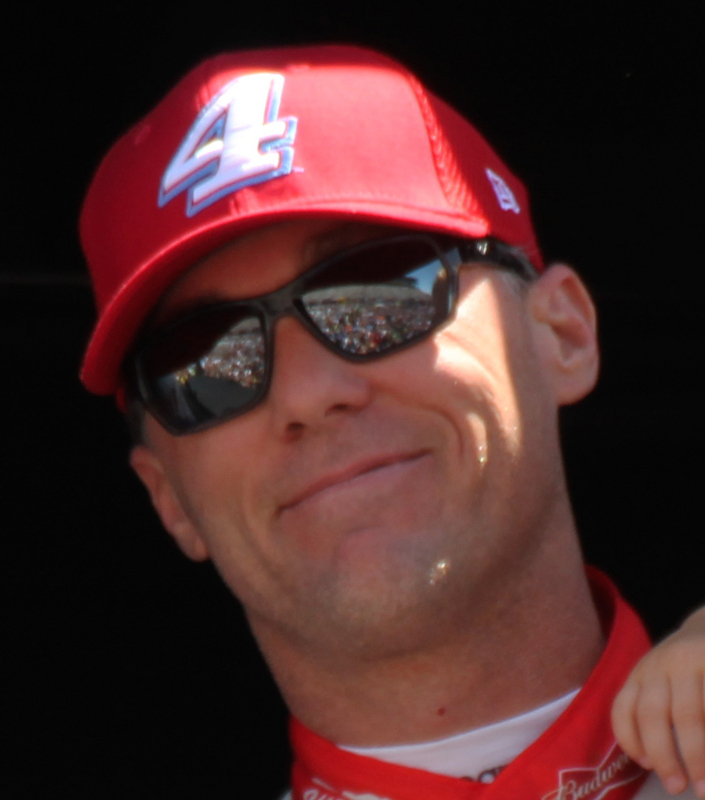 Harvick has 32 career Sprint Cup victories, nine of them in his 83-race tenure with SHR. Crew chief Rodney Childers signed a multi-year contract extension last June. The widow of the late NASCAR champion Dale Earnhardt, Sr. suffered a setback recently in her bid to prevent her stepson from using the family name in his business. The USPTO ruled in favor of Kerry Earnhardt, saying that his use of the term “Earnhardt Collection” did not create undue confusion or imply any association with his late father. Teresa Earnhardt has appealed that decision, arguing that Kerry Earnhardt’s use of the “Earnhardt Collection” name caused confusion in the marketplace and damaged her late husband’s brand. In fact, the panel cited Teresa Earnhardt’s own testimony that “since 2001 (the year of Dale Earnhardt’s death), sales of Dale Earnhardt- licensed merchandise have declined” as evidence that the man known as The Intimidator is not, in fact, famous enough to be granted the type of wide-ranging protection enjoyed by the estates of Elvis Presley or Marilyn Monroe. “Because of the extreme deference that we accord a famous mark in terms of the wide latitude of legal protection it receives, and the dominant role fame plays in the likelihood of confusion analysis, it is the duty of the party asserting that its mark is famous to clearly prove it,” wrote the panel in its decision. 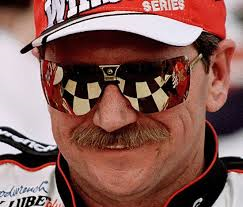 “In this case, while (Teresa Earnhardt) has established the renown of Dale Earnhardt, the former race car driver, there is no evidence that (she) has established the fame of the mark DALE EARNHARDT with respect to any goods. Moreover, even if we were to find that the mark DALE EARNHARDT is famous, such finding does not extend to (her) rights in the name EARNHARDT, by itself. Teresa Earnhardt’s appeal is scheduled to be heard by a three-member board. Experts in copyright and trademark law say that such boards rarely overturn the original decision of the UPSTO. Just a few days after NASCAR re-implemented rules requiring teams to install all five lug nuts on each wheel, the sanctioning body handed down a P3 penalty to crew chief Adam Stevens, after discovering missing lug nuts on the winning No. 18 Joe Gibbs Racing Toyota driven by Kyle Busch following last Saturday night’s GoBowling 400 at Kansas Speedway. Stevens was fined $20,000, suspended from all NASCAR Series Championship point-counting events through May 18 and put on NASCAR probation through Dec. 31 for violating sections 12:1 (actions detrimental to stock car racing), 10.11.3 (pit road equipment) and 12.5.3.4.1 (which outlines the P3-level penalty) of the NASCAR Rule Book. In addition to Stevens, front tire changer Josh Leslie was suspended through May 18 and put on NASCAR probation through Dec. 31. NASCAR also issued written warnings to the No. 43 and No. 78 teams Sprint Cup Series teams for failing pre-qualifying laser inspection twice, and the No. 7, 43, 47 and 48 teams for failing pre-qualifying template inspection twice. 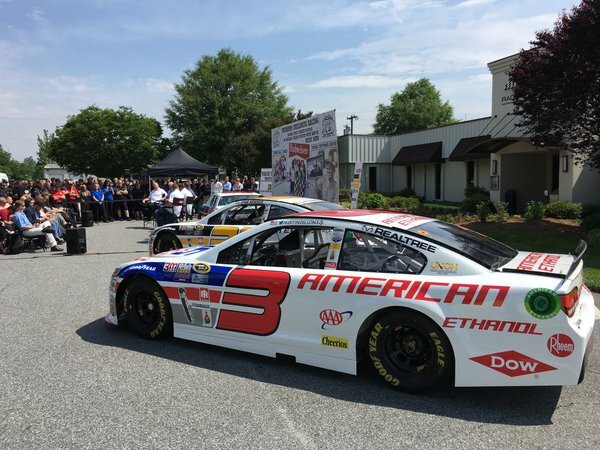 In celebration of Darlington Raceway's throwback race weekend, Richard Childress Racing unveiled paint schemes today for its No. 3 and 31 NASCAR Sprint Cup Series teams, to be raced in the Bojangles' Southern 500 on Sunday, September 4. Other RCR special paint schemes for the Darlington Raceway throwback weekend including the No. 27 Menards Chevrolet SS, will be unveiled at a later date. 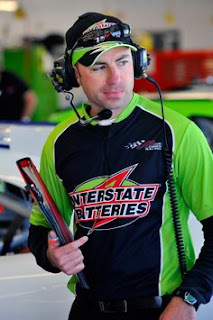 Rudd, who retired from racing in 2007, not only scored RCR's first victory that afternoon at the 2.62-mile road course, but also his first-career win. He held off the likes of Bill Elliott, Harry Gant, Kyle Petty, Darrell Waltrip and future RCR driver Dale Earnhardt. 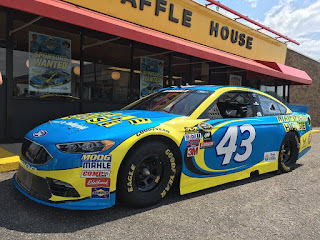 Smithfield and Waffle House will team up with Richard Petty Motorsports for the Bristol Night Race on August 20, when Aric Almirola drives the No. 43 Smithfield/Waffle House Ford in one of the most popular races in the NASCAR Sprint Cup Series season. The race will mark the third time that Smithfield, Waffle House and RPM have teamed up on the race track. During that three-year partnership, the companies created Waffle House Race for Rewards, an app that allows patrons to earn points by eating at Waffle House and redeem those points for Waffle House merchandise and Smithfield racing gear. 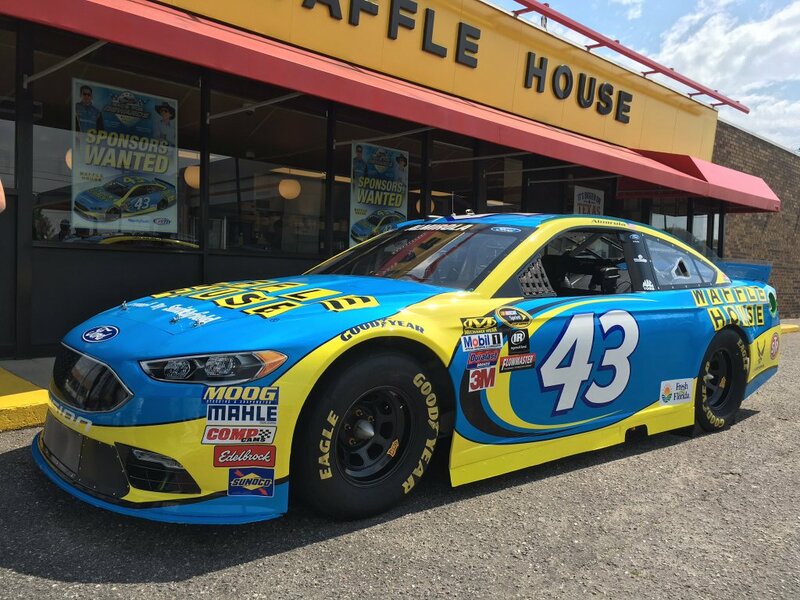 "Smithfield is a valued partner of Waffle House, and we're thrilled to share in their racing program with Richard Petty Motorsports and Aric Almirola," said Walt Ehmer, CEO, Waffle House. "This program allows us to reward our customers with unique products and opportunities. Racing, especially in the Bristol Night Race, brings a great platform to give back to our customers and earn some new ones too." RPM is in its fifth year of partnership with Smithfield Foods and the third with Waffle House. Last season, Almirola scored a fourth-place finish at Richmond International Raceway in the No. 43 Smithfield/Waffle House Ford. "We're thrilled to have Waffle House joining Smithfield on our No. 43 Ford," said "The King" Richard Petty. "The patrons at Waffle House are overwhelmingly NASCAR fans. It's exciting to pair three popular brands together to give back to race fans and Waffle House patrons." Ben Rhodes is off the Bozo List. 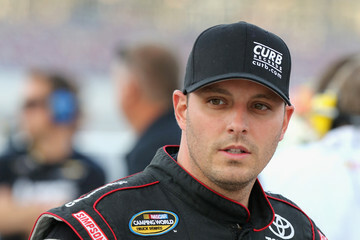 After crashing with Rhodes on the final lap of Friday night’s Camping World Truck Series race at Kansas Speedway, leader Johnny Sauter minced no words in expressing his unhappiness. He accused the 18-year old of being “brain dead or can’t see,” after the pair spun in the final turn, handing the race to rookie William Byron. Speaking on SiriusXM NASCAR Radio today, Sauter apologized for his remarks, saying Rhodes’ actions were not as underhanded as he had first believed. “Up until I had done that interview, I hadn’t seen any replays,’’ said Sauter, who limped his battered machine beneath the checkered flag to claim a 16th-place finish. “I was under the assumption that he just drove straight into the back of me, and that wasn’t necessarily the case. I called Ben and told him that all the things that I said, I take back. The Wisconsin native said that after viewing videotape of the final lap, his opinion of what happened has changed. “I came off Turn 2 and I had a pretty good lead,” he said. “I went down the backstretch and I swerved… to try to break the draft as much as you possibly can. When I did that, the floats in the carburetor (stuck) or something happened. Actually, the motor started missing a little bit -- a couple of times -- going down the backstretch. That’s ultimately what enabled him to get close to me. 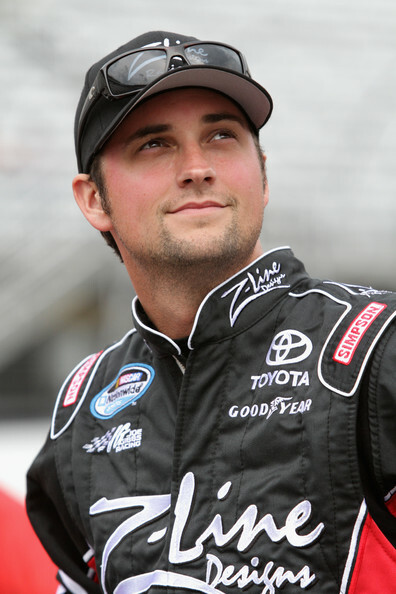 JGL Racing has added Drew Herring to the organizations "Young Guns" program. The Benson, North Carolina native will drive the team’s No. 24 Toyota at the upcoming Ollie's Bargain Outlet 200 NASCAR XFINITY Series event at Dover International Speedway on Saturday, May 14. The race will be Herring's 16th career start in the XFINITY Series. "I am really thankful for the opportunity to get behind the wheel of the No. 24 Toyota for JGL Racing," said Herring. "I look forward to working with everyone in Dover for the first time. Dover is a tough track and things happen fast there. It will be important for us to work well together from the very first lap so we get to know each other well and build a strong relationship. I have had the pleasure of being around the team in the shop and I know they are a hard working group of guys. I am confident we will all work together well and get better with every lap we make in practice, qualifying and the race." In his previous 15 NASCAR XFINITY Series starts, Herring has earned two Pole Awards, five Top-10 and one Top-5 finish. He also has one career start in the NASCAR Camping World Truck Series to his credit, which netted him another Top 10 finish. "We are excited to add Drew to the JGL Racing organization and The Young Guns program," added James Whitener, owner of JGL Racing. "While he has limited starts in the Series, he has countless hours of seat time as a test driver. We feel that he is a perfect fit for the Young Guns program and we look forward to having him behind the wheel of our No. 24 Toyota in Dover." 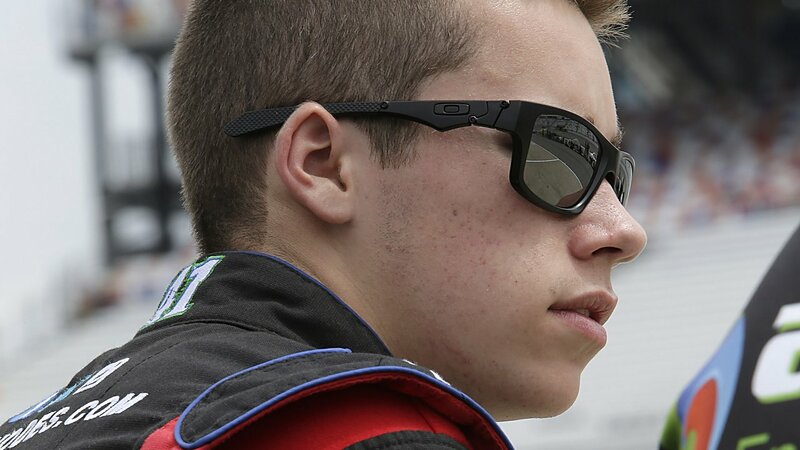 Herring joins Matt Tifft, Corey Lajoie and Brandon McReynolds as participants in the JGL Racing Young Guns program. Former NASCAR Camping World Truck Series championship team owner Steve Turner passed away Thursday evening in his native Texas, following a brief illness. A successful owner on both dirt and asphalt, Turner parlayed a highly successful Texas oil business into a winning NASCAR career. He purchased the former Braun Racing NASCAR Xfinity Series operation in 2009, renaming it Turner Motorsports. He captured the Truck Series title in 2012 with son-in-law James Buescher at the controls, before joining forces with Harry Scott, Jr. and renaming the team Turner-Scott Motorsports the following season. Turner left the sport in 2014, and had most recently resided in Houston. We haven’t heard much from you since the days immediately following the tragic loss of your husband on the final lap of the 2001 Daytona 500; days where you repeatedly stated how important the support and well-wishes of Dale’s fans had been in helping you and your family cope with your grief. We grieved along with you in those dark days, mourning the loss of someone we idolized and worshipped, both for his talent behind the wheel and for his ability to remain “one of us.” We still grieve his loss, but we understand that your loss far surpassed ours. We lost our hero that day, you lost your husband. None of us would presume to compare the two. We understand your decision to withdraw from the NASCAR community. We understand the conflicting emotions you must certainly feel for a sport that made your husband wealthy and world famous, only to take his life. We understand your reticence to return to the site of Dale’s death, and we understand your inability to maintain a daily presence in sport that took him from you. Racing is clearly no longer part of your life, and we get that. More difficult to understand, however, is your decision to deny the public -- Dale’s fans – virtually every opportunity to relive and rekindle the memory of his illustrious career. We’ve heard stories of you declining to loan race cars and memorabilia to organizations like the NASCAR Hall Of Fame, who desire only to preserve his memory and introduce the man called “The Intimidator” to new generations of race fans. Even worse, we hear of the distance – both physical and emotional – that exists between you and Dale’s three eldest children; Kerry, Kelley and Dale, Jr.; as well as the continuing battles over his legacy, his estate and the race team that once bore his name. It’s as if you believe that locking Dale’s memory behind closed doors – keeping it exclusively to yourself at the exclusion of all others – somehow endears him to us, even more. “Cornering the market” by micromanaging his memory and challenging his children’s right to their own last name may keep the cash rolling in, but it diminishes our memory of your husband. It also casts you – his widow and legal representative – in a very poor light. The bitterness you continue to display toward Dale’s children is impossible to defend. More important, it is not what he would have wanted. If you truly loved Dale – and we know you did – you should also respect his children. Short of that, the least you can do is avoid being a negative influence in their lives. Kerry, Kelley and Dale, Jr. don’t need your help. They're all doing quite nicely on their own, with no apparent assistance from you. Just don’t spin them out. Let them run their race, while you run yours. We assure you, Mrs. Earnhardt, that we are not stupid. We know the difference between the great Dale Earnhardt and others with the same last name. We are capable of differentiating between your late husband and his surviving children, all of whom have made successful names for themselves, both in and out of racing. And no matter what your high-priced attorneys may claim, we understand that Kerry and Rene Earnhardt’s latest business venture has nothing to do with a man who passed away 15 years ago. We do not see today’s headlines as an attempt on your part to protect The Intimidator’s legacy. We see them as a mean-spirited effort to prevent Dale’s children from using their own name; a name they were born with, and which you merely inherited by marriage. It is their birthright, and you are wrong to deny them that right, based on nothing more than capitalistic greed. You are an Earnhardt, and always will be. But you are not the only Earnhardt. It is irresponsible and self-serving to insert Dale’s name into a senseless dispute where there are no winners, only losers. You didn’t ask for our advice, but we will offer it, nonetheless. Perhaps it’s time for you to invest as much time and energy to supporting your late husband’s children – all of them – as you do to safeguarding his money. Perhaps then, we will once again be free to remember him (and you) as fondly as you both deserve. Rest assured that we will never forget Dale, no matter how closely you guard every trophy and trinket. Clint Bowyer will return to NASCAR Xfinity Series competition with JR Motorsports at Chicagoland Speedway on Sept. 17, driving JRM’s No. 88 Chevrolet with sponsorship from Morton Buildings. Based in nearby Morton, Ill., Morton Buildings specializes in constructing farm shops, equestrian facilities, hobby buildings, garages, churches, municipal buildings, airplane hangars, custom homes, commercial structures and general storage buildings. The company is now in its third year of partnership with JRM. A native of Emporia, Kan., Bowyer earned a NXS championship in 2008 and tallied a total of eight career victories in the series. His most recent NXS start came in 2012 at Daytona International Speedway. Bowyer, who currently races full-time for HScott Motorsports in the NASCAR Sprint Cup Series, is named as the ninth driver to pilot JRM’s No. 88 “All-Star” Chevrolet in 2016. He joins Josh Berry, Alex Bowman, Cole Custer, Dale Earnhardt Jr., Chase Elliott, Kenny Habul, Kevin Harvick and Regan Smith. In nine starts this season, the team holds two wins (Daytona and Richmond), five top-five and eight top-10 finishes. NASCAR announced the 2017 schedules for its three national series today, giving fans and stakeholders a significant head start in planning for next season. The sanctioning body finalized the 2017 schedules months ahead of previous years, thanks to a new, five-year sanctioning agreement between NASCAR and its tracks. One notable change to the 2017 NASCAR Cup Series schedule is a date swap between Talladega Superspeedway and Kansas Speedway; with Talladega becoming the second race in the Round of 12 (Oct. 15) and Kansas inheriting third and final race in that round on Oct. 22. Texas Motor Speedway’s spring Cup race shifts to Sunday, April 9, while Dover International Speedway’s spring date moves to June 4; onea week after the Coca-Cola 600 at Charlotte Motor Speedway. Michigan International Speedway’s second race will return to its traditional early August slot, on Aug. 13. The NASCAR Cup Series 2017 schedule opens with the Daytona 500 at Daytona International Speedway on Sunday, Feb. 26 and culminates with the Championship Race at Homestead-Miami Speedway on Nov. 19. The NASCAR XFINITY Series will kick off at Daytona on Feb. 25, and crown its champion at Homestead on Saturday, Nov. 18. Its schedule features four standalone events – Iowa Speedway (July 29), Mid-Ohio (Aug. 12), Road America (Aug. 26) and Kentucky Speedway, the first event in the NASCAR XFINITY Series Chase (Sept. 23). For the second consecutive season, Iowa will host a NASCAR XFINITY Series-NASCAR Camping World Truck Series companion weekend on June 23-24. The NASCAR Camping World Truck Series opens its season at Daytona on Feb. 24, and culminates at Homestead on Nov. 17. Five standalone races are included among the 2017 lineup: Texas Motor Speedway (June 9), Gateway Motorsports Park (June 17), Eldora Speedway (July 19), Canadian Tire Motorsport Park (Aug. 27) and Las Vegas Motor Speedway (Sept. 30). The NASCAR Camping World Truck Series Chase once again begins at New Hampshire Motor Speedway (Sept. 23).